MERRY XMAS JOSEPH THOMAS - SHAME ON THE FEDERAL FASCISTS. THE WICKED OLD WITCH IS DEAD! An innocent Victorian man who is facing federal fascism has had his second application for bail refused? Joseph Terrence Thomas, 31, from Werribee has been charged with intentionally receiving funds from a terrorist organisation, namely Al Qaeda, and providing the organisation with support and resources? He is also facing a charge of possessing a false document. 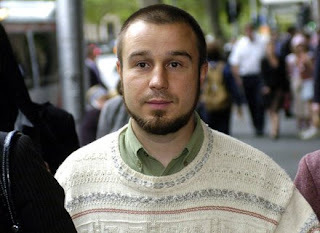 Thomas was arrested last month and the Melbourne Magistrates Court initially refused bail. But federal fascist prosecutors argued Thomas is acting as a sleeper for the terrorist group? ZZZZ! Yesterday the Supreme Court refused bail on the basis there was not enough evidence to satisfy exceptional circumstances? But there's no concrete evidence either! ZIP! So on a truth scale say, from 1-10 I'd give that a 1. And if that's not a good reason to get bail then all that's required to isolate you in custody in a dungeon is hearsay! Hearsay from a bunch of federal fascists and their cronies. Thomas' father Ian says he will continue to support his son. "We are very sad - in fact we're bitterly disappointed, but we love our son and our daughter-in-law and our grandchildren our two little granddaughters - we will continue to support him."